The constant pressure and motion of teeth grinding, also known as bruxism, can cause wearing of the biting surfaces of the teeth, as well as muscle and joint soreness. 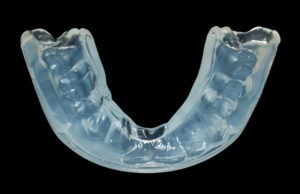 A night guard can be worn to treat the effects of grinding. Many people are unaware that they are grinding at night. However, tell tale signs of bruxism include flattening of the tooth structure, a sore jaw, headaches, or earaches. These symptoms are collectively known as temporomandibular joint (TMJ) dysfunction. If on dental examination the patient shows signs of bruxism or TMJ dysfunction, a nightguard will be recommended.The appliance may not totally prevent grinding and clenching, but will prevent further wearing of the tooth structure and will help to decrease the muscle spasm and headaches caused by the grinding. If the patient is experiencing TMJ dysfunction additional recommendations will include stress management, joint and muscle massage, application of moist heat, proper rest, eating soft foods, and elimination of chewing gum and caffeine. Over the counter anti-inflammatories or analgesics can be very helpful as well.